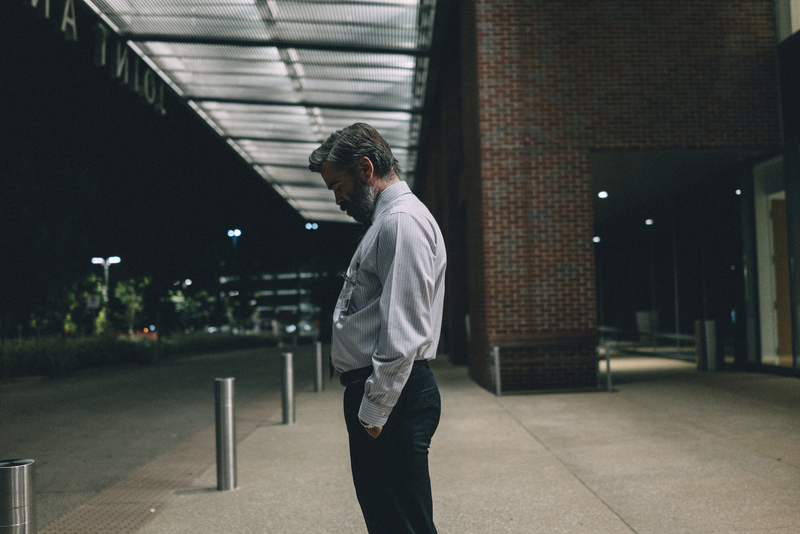 Two years on from The Lobster, pioneering Greek Weird Wave director Yorgos Lanthimos returns to the London Film Festival with his 2017 Palme d’Or nominee The Killing of a Sacred Deer, a dark and twisted psychological thriller set in suburban America. The first sight we see is a beating human heart. It looks nothing like the Valentine’s card image. It seems to be a struggling alien creature, a facehugger, in constant agitated movement. The shot might well be a sly joke as what follows over the next two hours could be seen as evidence of heartlessness, but as the camera pulls out to reveal an ongoing surgery taking place. The surgeon is Stephen (Colin Farrell). Even as he walks down a corridor with a colleague discussing the relevant merits of their watches – leather strap verse metal strap etc – it becomes apparent that we are in Lanthimos country. Conversation is stilted, pleasantries exchanged but the delivery is the forced calm of a hostage situation. Werner Herzog made an entire film with his cast under hypnosis (Heart of Glass) and here the effect is similar. When Nicole Kidman shows up as Stephen’s ophthalmologist wife Anna, it feels like this might be an Invasion of the Body Snatchers sequel featuring only the aliens who have taken over the planet. Their two kids, young Bob (Sunny Suljic) and teenage Kim (Raffey Cassidy), who has just had her first menstruation we hear, are similarly so ordinary that they’re odd. However, the real mystery is Martin (Barry Keoghan), a young man Stephen surreptitiously meets, but whose relationship to Stephen is at first unclear. Are they father and son? Lovers? Martin is one shade darker in the fifty shades of crazy and when Stephen becomes disturbed by his young friend’s attempts to pair him off with his mother (Alicia Silverstone), Martin reveals that he wants revenge for his father’s death. Each member of Stephen’s family will one by one become paralysed from the waist down – Bob already is at this stage – and then after their eyes start to bleed will die within hours. This can only be stopped if Stephen kills a member of his own family. The family-in-peril genre has had its fantasy figures – from Harrison Ford to Liam Neeson – and more feeble counterparts – Straw Dogs, Funny Games – but Lanthimos doesn’t play to anyone else’s rules. As things become increasingly desperate, the characters accept the logic of the film’s own sociopathic brand of magical realism with almost frightening alacrity. In Farrell and Kidman, he has found two performers who are utterly willing to go the whole hog and their performances are brilliant deadpans. This is arthouse Marmite and some will hate it without a doubt, but for this critic if David Lynch is actually bowing out of cinema then the heir for the surrealist visionary might well turn out to be Yorgos. For our full coverage of this year’s BFI London Film Festival follow this link.